Indeed very interesting. And also a lot of work and time and effort is needed to run a mating station. You need an isolated area. You also need hives especially selected and stimulated for drone production. Drone hives have to be fed at all times. You need cell building hives, you need finishers. You need a very precise time table and plan. Very complicated and quite the opposite of what one considers natural beekeeping. But someone has to do it. Conervancy of a protected animal like the Black bee is an important task. Also it should not be conservancy of a current state rather than developing a Black bee for the future. Nature is in a current flow of energy and changes all the time. It sometimes appears to the observer, that something is fixed and stable, but if you look closer it is just a stabilization produced by balance. Engery that is balanced. The energy still moves, but because it conserved in a spiralling movement it looks like it is stable and forming a shape. A closer look reveals it is alive and running, but stable through balancing the energy. So live the change, find the balance. Form things. I'm afraid I too have reservations about this project. The whole issue of queen rearing is something I am not comfortable with (especially in the context of natural beekeeping) and there seems to be a slight air of snobbish, elitism surrounding the whole British Black Bee program. Is there really any difference between the British Black Bee, the Manx Black Bee, the Gaelic Black Bee or Black Bees from any other northern European country. I agree with Bernhard in some respects, that trying to keep bee strains pure is perhaps not healthy or natural and whilst I appreciate that you are trying to turn back the tide of foreign imports and perhaps an element of "good (maybe even patriotic) marketing" is required to encourage a trend back towards more native bees, I am not comfortable with it. I prefer my way of slowly and steadily flooding the area with dark mongrel swarms that have proven survival ability. My bees seem to prefer that way too! Kate Thompson at Leeds University compared Wing samples from UK ferals with microsatellite markers associated with Amm. She found no correlation. Wing morphometry was devised by Ruttner to distinguish between pure race subspecies. It is of no use in trying to tease out Amm samples from a hybridised background population. If you start with pure Amm it is useful for identifying hybrids which superficially look like Amm in terms of other morphometric variables such as colour. Zaunreiter. Inbreeding is a complete red herring. You would only have a problem if someone was raising 1000s of queens from a single mother and using the daughters as the sole basis of a breeding programme There is massive variation within an Amm population. Check out the Jensen and Pederson paper (2005)on the NIHBS website. >I personally find the breeding methods by Brother Adam very close to what nature does. Are you serious? He used 22 different subspecies to make his Buckfast bee including subspecies from Africa and the middle east. He combined genetics from subspecies which would never ever overlap in range. Where you have two subspecies in geographic proximity such as Amm and Carnica you will obviously get some mixing of genetic material at the interface between the two populations. Brother Adam was a gifted bee breeder but his premise was about as unnatural as you can imagine. There is massive natural variation within a given Amm population. The focus should be on identifying colonies within that population which can deal better with mites through hygienic or grooming behaviours. This is what the NUIG project is looking at. You can develop this within the Amm population without the need to introduce genetics from any other subspecies. When you hybridise a supspecies it is lost for ever. You cannot backbreed from a mixed up population. >Is there really any difference between the British Black Bee, the Manx Black Bee, the Gaelic Black Bee or Black Bees from any other northern European country. The populations will be closely related but there will be some variation across the range. ie I would not expect the population in Connemara to be exactly the same as the Amm population in Poland. The same thing happens with many bird species. You get slight differences in markings or song between one side of the natural range or the other but a bluetit living 1000s of miles away from another bluetit will still share most of the genetics. Keeping non native subspecies in the British isles is a threat to the only native bee as all the mellifera subspecies and Buckfast can freely interbreed. There are areas in the UK which still have good populations of Amm and these need to be protected from the introduction of other subspecies or mongrelised/hybridised bees. Inbreeding is a complete red herring. Brother Adam was a gifted bee breeder but his premise was about as unnatural as you can imagine. I didn't recommended his premises but his methods. Which boils down to: Keep a pure line, the main line. Separateley keep a second line where you introduce foreign genetics (be it AMM or not). Introduce the good results into the main line after carefully testing it for some (bee) generations. It is the combination of line breeding, cross-breeding and hybridization (hybridization is only a part of what Brother Adam did). 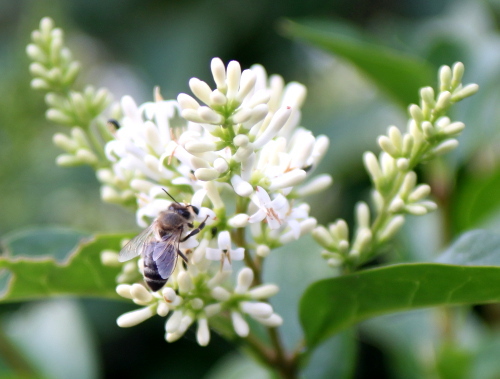 A lot of beekeepers either tend to line breeding or producing hybrids. It is the careful use of all three mechanisms, which all are important in natural evolution! That was my point. I am reading and considering all posts in this thread and comparing your comments with what I have read elsewhere and my own experiences. Our local (Cornwall) Bee Geek has both morphometry and DNA analysis at his command, so identifying 'pure' strains and variants is not a problem. His graphs show scatter patterns that identify AMM ecotypes, seemingly with considerable accuracy, and I will make it my business to study his techniques in more detail when time permits. I am all for Barbara's method of encouraging the spread of local survivor stocks: that would be a contribution all beekeepers could make to the long-term goal of establishing localized ecotypes across the country and removing the need for importation. Meanwhile, we will take care not to raise hundreds of queens from a single queen, or even related queens, and with several isolated mating stations, we should be able to conduct controlled mating experiments along Bro. Adam's lines. The bee geeks aka the old guard in Bibba are the people who have used wing morphometry for years and will not accept that it has now been demonstrated to be worthless as a tool for finding Amm in mixed or hybridised populations. A concept known as denial! demonstrated the fallacy, and the recent work by Kate Thompson at Leeds Uni which compared the wings to the microsatellite markers put the final nail in the coffin. I spent years using wing morphometry and took data from dozens and dozens of colonies and had loads of colonies showing 100% Amm wings but I now believe that it is unhelpful as a tool other than if you start with pure race and use it to detect hybridisation in subsequent generations. If you use wing morphometry as a selection tool you will most likely be breeding lookalikes rather than Amm. DNA is the way to go, microsatellites or SNPs as opposed to mitochondrial DNA which only gives you info about the origin of the maternal side. thank you for your comments, there is much here to consider. As you know I have used the wingmorph software, scanned bees wings and come up with the scatter grams. So, to inform others, the scatter gram gives you a plot of the particular wing scanned. You scan 50 right wings or 50 left wings from a sample of bees you take from the hive. Simply speaking, the venation on the wing is measured by the software and this puts an X on a scatter graph to indicate where that particular bee sits in the sub species types. There is a place on the scatter graph for Am mellifera, Am carnica and Am ligustica and all the others. These regions on the graph have been worked out as being the typical places each sub species sits in relation to their wing venation. Is that a reasonable simple explanation. I can not tell. So in a sample of 50 wings, 40 sit roughly in the Amm region on the graph drifting toward the 10 that sit in the Aml region of the graph. So the assumption I have made by talking to others is that my sample of bees originating from my queen has some workers that mostly show Amm venation, some fewer that show Aml venation and some in between. This would kind of be right if the queen had mated from multiple drones, mostly Amm, some hybrids and Some Aml and different sperm was used over a short period of time. I freely admit I do not know the mechanism for sperm selection by the queen or if it is the usual 'race to the finish line' scenario. My understanding then works like this. When next breeding queens one has to be aware that an egg selected to be a queen may have those Aml wing venation genes and therefore if that then is one of your breeding queens, then that population is moving away from Amm characteristics toward Aml characteristics, using wing morphology as a 'barometer'. So if that is the case in order to breed Amm, that being the bee with the best characteristics to thrive in our wet, windy and unpredictable climate (as is postulated) then it makes sense to breed from the queen with workers with the tightest cluster of results in the Amm section of the graph. Does that make sense to all interested. So Jon, is my interpretation of the graph in line with the thinking behind the production of the scatter graphs? Have I and others interpreted the intention of the generation of this data correctly? If that is the case are you saying that it is the presumption that these markers on the wings are the things that can characterize the difference between the different subspecies is wrong? In essence it is the idea of wing morphology that is at fault and therefore the software made to find it just feeds into erroneous thinking? Coming back to the topic of Black Bees, I have been going on about this for a number of years so am greatly pleased that this new venture is being started in the natural beekeeping sector, that this important conservation issue is becoming more prominent here. It is absolutely pointless to have bees that switch on egg laying in that warm week in February thinking winter is over, lets get going, only to have them wiped out by arctic conditions in April as happened a mile from me last year. However we must not forget this is a complex issue and as more research is done our understanding gets better and better, or worse and worse if it is rubbish research like some I have seen. So we need to be adaptive. At present we cannot stop importation to most of Britain so the gene flow is wide open, and as it is easier to produce queens in places with a longer season, ie south of here, then with the demand for bees as it is, those are what we are going to get. Until there are more home grow queens that can satisfy the market then that is going to be the case. The BBKA has advised home grown queens for a number of years and state they do not approve of importation. However, as with all things, people hear one thing and do another, also the BBKA does not represent all bee keepers. This is small but significant steps. What you are describing re morphomery is what the practitioners do but there is no logic to it. What you are doing is selecting just for wing pattern - not the rest of the genome. There is no evidence that wing pattern is linked to any of the rest of the underlying genetics. The genes which control wing venation pattern may in fact have no linkage at all. This means that you could end up with bees which have Amm pattern wings even though the underlying genetics is only 10% Amm. This is one thing Kate Thompson looked at in her work at Leeds and she found there is no relationship between the wing pattern and the microsatellite markers associated with Amm. ie, it is of no use to pick out Amm bees from a hybridised population. This is proper peer reviewed science as opposed to the musings you get from some of the Bibba folk on this subject. Consider this. If you crossed a pure Amm queen with Carnica drones would you expect the wing venation pattern values of all the workers to be exactly half way between the two? I would say you more likely get a complete bell curve range so even though the genetics of all the workers is clearly 50/50 you will have some with almost perfect Amm wings and some with almost perfect Carnica wings and some in between. What are the implications of that? This is what I mean when I say it has no validity in an already hybridised population. It is only of use to pick out hybrids in the workers produced by the open mated daughters of the pure race queen. In the Moritz paper he found that the German Carnica population had perfect Carnica wings but when he looked at other variables there was actually a lot of Amm genetics in the so called Carnica population. If you select for Carnica wings you get bees with Carnica wing pattern irrespective of the rest of the underlying genetics. Moritz suggested either (a) dropping wing morphometry altogether or (b) switching to other morphometric variables every couple of years to avoid the selection artifact he described in his paper. There are over 30 morphometric variables such as tongue length, wing length, hair length etc. Ruttner devised wing morphometry to distinguish between pure race subspecies, not hybrids. You are right to question the concept of wing morphometry in this respect. It does not work with a hybridised or mongrel population. The software does what it is supposed to do but it is concerned with taking the measurements rather thanthe interpretation of the measurements in terms of the rest of the genetics. Thanks for bringing that to my attention, Jon. I have done a little morphometry - just enough to understand the process - but I must say that my priority is not with 'purity', but with raising bees capable of independent living in our climate, with a decent temperament, resistant to disease and able to manage their mites. To me, that suggests Amm as a good starting point, as their genetics seems to carry the right stuff for survivability, at least. I am certainly not as obsessive as some BIBBA people about 'racial purity', and I will be breeding from the strongest survivor stocks, rather than necessarily those with predetermined characteristics.However, we will be very much in Amm natural territory (coastal Devon and Dartmoor) and my experience so far tells me that it is their character that will predominate. In any case, we will be monitoring at every stage, so it will be interesting to see how it develops. I have done a lot of morphometry and I bought an Epson V330 scanner especially for the purpose. Everyone loves it as it gives the impression of being able to do some real science without having your own DNA lab. Unfortunately, I don't think it is that helpful at picking out Amm type bees. Micheál Mac Giolla Coda and his daughter Aoife have spent 25 years selecting and improving the native bee in the Galtee Valley in Ireland. The bees are productive healthy and docile. 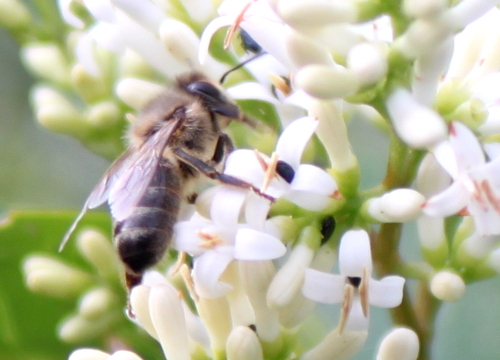 There is still more work needed to get a native bee which is more varroa tolerant than at present. 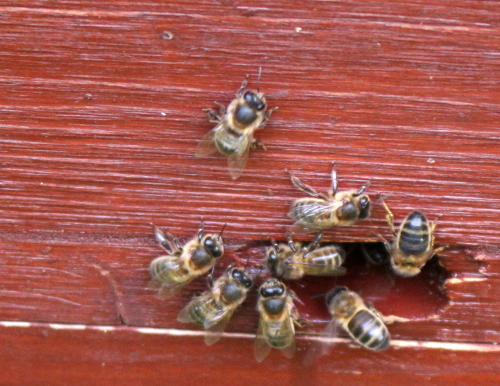 There are at least half a dozen breeders in Ireland producing really good dark bees. There is also very good stock in Wales, parts of Scotland and especially Colonsay where Andrew Abrahams has managed to get protected status for his bees. He is the only beekeeper on the island and he works with 60-80 colonies. The stock is varroa free and no bees have come onto the island for many years. With regard to the inbreeding problem, Andrew has not seen problems and he works a closed population of only 60-80. There are about 500 colonies on the Isle of Man, so they should be fine for some time. "My view is that it may be possible to breed (select) a bee with 'good' morphometry but that is not necessarily Amm. However, whilst that is possible, I have seen no evidence that it has been achieved. Kate Thompson did say that morphometry is not a good guide in the case of hybridised bees. However, I believe you can select a near-native bee by appearance, which, if tested, will show good morphometry and also show good results when DNA analysed. As a result I am happy to select my bees by appearance, the benefit to me being that they breed true, unlike the hybrids which throw very varied offspring, which is not much use in a breeding programme. Some people are very proud of the morphometry of their bees but the figures are not really that important. Morphometry is a tool which can be used to help us select within a strain and so breed true. The fact that someone could develop an Italian bee with the morphometry of an Amm does not really come into it." >However, I believe you can select a near-native bee by appearance, which, if tested, will show good morphometry and also show good results when DNA analysed. As a result I am happy to select my bees by appearance, the benefit to me being that they breed true, unlike the hybrids which throw very varied offspring, which is not much use in a breeding programme. That is a far more logical approach and if you can get access to Dna testing from time to time it would be a big help. Watch out for Carnica as it is also a dark bee. The Carnica AMM cross is described by Ruttner as the most aggressive so that could well be an indicator. In my area there is next to no Carnica but there are a few Buckfast fans. Yellow body colour is dominant over black (in spite of what many will tell you) so introgression from Buckfast should show up easily as yellow banding in some of the workers. Great project. In 1852 a fellow named Richard Kimball came from Florenceville, New Brunswick with what we called black german bees . The Kimball family came from England. These bees lasted until the winter of 1982-1983 when at that time under my watch they died out. Actually, most of the bees in this area died out. I did not know what I was doing anyhow so I gave up on bees. Last year I made a bunch of top bar hives but could find no black bees so I went with Russian hybrids - still don't know what I was doing. Anyhow - the bees we had originally were probably interbred with who knows way over the years, were as feisty as they were productive. Management was negligible, yet they produced and propagated. We also called them the English Brown bee. I did locate black bees in Ontario, NB but doubt I could get them across the border easily. johnelbar - thanks for that interesting snippet from Maine! "I am not a scientist, but an engineer and a fairly observant beekeeper. It is my view that the closer you are to purity, the more accurate wing morphometry is, the further from purity the less accurate. I have measured bees in a colony of mixed colours where the dark bees are all outside the Amm box, when all the yellowish are inside. Clearly the latter shows there is a problem, as Amm shouldn't have yellow markings. When using DrawWing it is my opinion that some points have to be manually moved, otherwise a false reading is given on the cubital index. I wonder if Kate Thompson actually realised that and made adjustments. I doubt it. We must remember that wing morphometry is only one measurement, which is not often realised. It was used mainly before DNA techniques were developed, so at one time that is all they had. Jon ***** has great faith in DNA, but where did the original samples come from? How do we know they were pure? Just because something is researched and peer reviewed doesn't mean it is correct and we should use it for reference without question. I think wing morphometry is a useful tool, not to show what something is, but to show what it isn't. I have a reasonable amount of faith in samples that come from locations where they are likely to be fairly pure, but where they are fairly heavily mongrelised, yet look pure, the results are usually very scattered. I stress the above are my own personal views, not necessarily those of BIBBA." That sounds like Roger P! He is the denier in chief re. wing morphometry as he used to run the training courses for Bibba. Actually, reading that it sounds like he has moved back quite a bit for what would have been his earlier position and the prevailing Bibba view on wing morphometry. The Bibba magazine was dominated by articles on wing morphometry for years and a lot of them made little sense. The articles often focused on the intricacies of accurate measurement as opposed to whether the fundamental assumptions re wings being able to pick out Amm samples were valid in the first place. I agree with him that wing morphomety is useful in pure populations. That is how Ruttner intended it to be used. As I pointed out in previous posts, if you start with a pure mellifera queen and raise daughters from her, the morphometry will pick out daughters which have mated with non mellifera drones. And DNA in a population changes somewhat over time but not to the extent that you could confuse Ligustica with Mellifera or Carnica. Each population has its own distinctive microsatellite markers. There are black bee samples in the Linnean collection and also from the York Viking dig. There is also a black bee population in Tasmania which was moved there from England around 1850 so there is DNA available from pre importation days. Kate Thompson did a presentation on her findings at the Bibba AGM last year and she told me it went down like a lead balloon. No-one wants to be told there aint no Santa Claus! The response from many wing morphometry devotees is to question the accuracy of DNA because it does not match the wings. Kafkaesque. I agree that current scientific evidence supports the assertion that 'yellow' is dominant over 'black'. But even in the face of such evidence, Johnson, Oldroyd, Barron and Crozier rather bravely reported that 'black' was observed to be the dominant colour during their 2001 experiments. Curious. Also, if yellow is indeed always dominant over black in practice, how does one explain the process of mongrelization - even that involving Italians - which invariably results in a) predominantly black bees, and b) often (although not always) vicious over-defensiveness within those black bee colonies ... from which AMM has - rather unfairly, and principally because of it's colour, I'd suggest - earned itself such a negative reputation ? Indeed - for many - AMM and 'mongrel' have become almost synonymous labels - presumably, because of identical, or near-identical colouring. I sometimes wonder if anecdotal claims of extreme viciousness resulting from the Carnica/AMM cross is not also based on a prejudice against the more-or-less identical colouring of both of these black bees, rather than other factors. There has to be some underlying reason why 'Black Bee' has become so widely synonymous with 'Bad Bees'. The reason is, the black bees are more defensive than others. Always been. You can find oldtimers in the Luneburg Heathland that can tell you firsthand experience, lifetime experience with the Apis mellifera mellifera lehzenii, a local black bee. Also you find that bee still alive and can get your stings - just to make sure you don't have to believe tell-tales. The good news is, you can easily breed for more peaceful bees, simply by selecting. Another good news: there is a difference between vicious and defensive. Pure agressive vicious bees attack for no apparent reason and at a long distance from the hive. While defensive bees only attack near the hive and mostly there was a reason. You want a defensive bee, that combats wasps, mice and other unwanted visitors (mites?). But you don't want an overly defensive bee who attacks everything that moves. Zaunreiter, I suggest you try and visit some projects working with black bees/Amm. Some of the bees in the Galtee Bee Breeding can be worked without any protection. I have seen that myself and have photographs of the demonstration. I don't own a beesuit myself. I use a £5 observation smock as protection when working with my bees and that it more than enough. It's just to keep the bees away from my face. The 'black bee is bad tempered' stuff started with Brother Adam who clearly had an agenda to argue that his Buckfast creation was superior. It was also perpetuated by some of the well known commercial bee farmers such as Manley who had a vested interesting in using imported stock. If you look at old photographs and film of black bees in the 1930s the beekeepers are often working with no protection or minimal protection. The big problem today is hybridisation between the subspecies and Buckfast. This creates aggression due to heterosis/hybrid vigour. All the commonly used subspecies are docile in their pure form. The problem arises with mongrels and hybrids which are often more aggressive than desired. BBC - the abdomen colour and dominance was carefully researched by the well known polish bee scientist Jerzy Woyke. He identified a series of genes and a series of modifiers which determine the colouration. The paper used to be online but I can't find it anymore. Check out the level of protection used by the demonstrator. These are black bees in Tipperary. This video from the 1930s shows French Amm being installed at an Apiary in Scotland, probably Craibstone. Again, note the beesuit needed to handle those aggressive black bees! Click on the video link above from the 1930s. The myth that black bees were always bad tempered just wont die. Someone who states, that black bees are as docile as other bees never had real black bees, my friend. As you said yourself above you need to select for optimum results. When you breed queens you get a range of characteristics and even with sister queens, some colonies will be better than others. All commonly kept pure race subspecies are docile. You could argue that some are more docile than others but the main factor producing aggression is hybridisation. This was a little cast swarm or abscond of black bees we came across at the site of the queen rearing group the night of our barbeque last August. Good on ya. Nice bee garden. Do you produce queens only or do you make some honey, too? The videos do not show a full hive, so I wonder. I also know a black bee enthusiast here in Germany, who doesn't do any honey. He also has many mating hives and nucs, only few full hives. 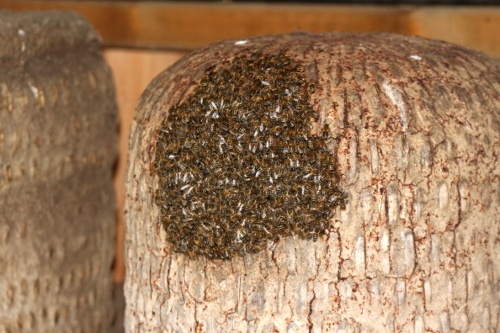 The full hives are deep Dadant hives, two deep brood chambers per hive. 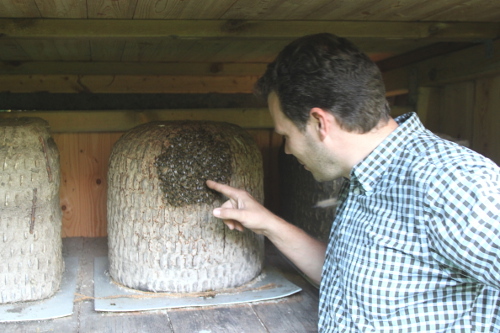 Nucs are less defensive as full hives. 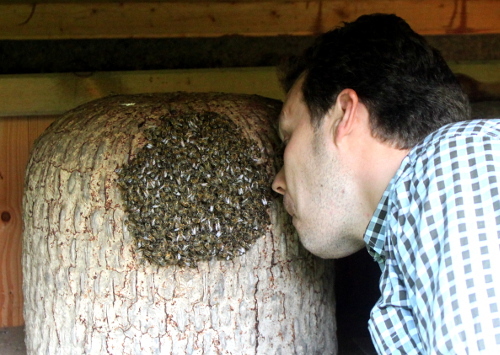 I am most interested in rearing queens and intend to scale up a bit this year. But it's hard to keep bees without getting some honey as a by product! I intend to set up a new apiary with 6-8 colonies just for honey production this summer and have a site lined up. At the moment I have about 15 colonies and 20 nucs and about 10 queens in overwintered double apideas. I start grafting at the end of April or start of May so should have a load of new queens by June. Queen rearing takes a lot of time if you do it properly. It's pretty much a 7 days a week job over the summer. You need your drone producer colonies packed with drones by early June. I let mine draw at least 2 frames of drone comb in the brood box. Are your queens open mated? How do you keep the lines pure? Drone saturation and finding mating sites which are reasonably isolated. There is very little Carnica here, just some Buckfast or Buckfast origin mongrels so introgression of genetic material will show up as yellow banding in some of the workers. A queen like this is still ok to head a drone colony as her own drones are not derived from the drones she has mated with. I would never graft from a queen which had any workers with some yellow banding. I have DNA samples in with the two University projects I mentioned earlier in the thread and I am hoping to get some feedback shortly. II would be a great help but it is not for mass production of queens. You would expect to pay several hundred Euro for an II queen. The other key factor is to get your local beekeepers working together. The queen rearing group I started several years ago has about 50 active members and everyone is working with Amm stock. Two of us do most of the grafting and individual members manage their own apideas. Every year I think the percentage of Amm drones in the background population must be rising a little. Beekeeping always works better when you get beekeepers working towards a common goal. Another factor is that a lot of Amm queens mate over the apiary as opposed to flying to a more distant drone congregation area. I have seen this more than a dozen times at 4 different mating sites. Jon, thanks for your thoughts and the information concerning morphometry. I am glad I did not buy that scanner you mentioned, only borrowed it along with a windows computer to run it all on. I did pick up a nice swarm locally which initially I thought were mine from a previous year or two but over time I think they were Carnies....small gold bands that my bees do not have. The hottest bees I picked up two fields away from my house were small ginger bees, which I had to re-queen as they smelled me coming from two fields away from the wood I quarantined them in. We have lots of bee keepers round my former house lots of them importing from here and there. If what has been said is so then as my bees become more mixed the more defensive they will become.